Wentworth is a dynamic, often confronting, drama series beginning with Bea’s early days in prison. Set in the present day, it is a modern adaptation of Prisoner contemporising legendary characters and their stories for today’s audience. Season 2 picks up three months after the events of that dramatic ballpoint pen ending. Bea has languished in the slot while Franky has risen to top dog. And we’ve now got a new Governor, Joan Ferguson who is going to hammer down on the inmates. 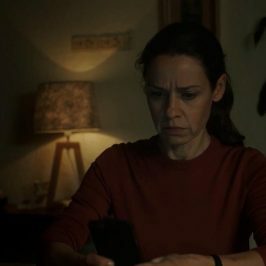 On the inside, Vera and Ferguson must deal with the fallout from Bea’s death; while outside, Franky’s life of freedom is jeopardised by an obsessive Mike Pennisi. Recovering from Bea’s death, Allie returns to Wentworth seeking vengeance against Ferguson. But her attack is thwarted when Ferguson seizes the opportunity to make a powerful statement and create a sense of fear around her. Vera is faced with the problem of finding out who let Bea into a restricted area to be killed by Ferguson. Covering her own tracks, Vera is forced to compromise her own ethics by pinning it on a scapegoat. While Franky finds her life unravelling when the man she assaulted, Mike Pennisi, reappears in her life. Franky returns to Wentworth accused of murder, and becomes convinced that Ferguson has set her up. Franky is back, charged with the murder of Mike Pennisi. She believes she has been framed by an accomplice of Ferguson. But proving her innocence and salvaging her relationship with Bridget seem almost impossible on the inside. A nervous Liz prepares for her imminent appearance as Witness X, living in fear that Sonia will surely catch her out. Someone discovers Liz’s secret; are they friend or foe? Vera undermines Ferguson’s “selfdefence” plea in Bea Smith’s slaying. With the murder charge against her dropped, Sonia is free to tie up loose ends. Sonia enjoys her freedom but there are still some loose ends to tie up. Liz, back inside, clings to the hope that Don will get her perjury charge dropped. Franky starts to put her escape plan into action, as Ferguson exploits Jake and Tina’s drug flow problem to her own advantage. Kaz accuses Will of being a drug supplier but is forced to see him in a different light when he heroically saves her life. Franky’s escape plan goes haywire with unforeseen and near-tragic consequences when Kaz and Will are victims of a brawler accident. Allie claims responsibility for the accident in an attempt to convince Tina of her allegiance in exchange for heroin. Meanwhile, Doreen fronts the Board for her transfer application but despite an impassioned pitch, is devastated when her request is refused. And Lucy seeks Liz’s help in an attempt to extort money from Sonia but Liz sees this as an opportunity to get Sonia put into Protection. Ferguson enacts her plan to become top dog and destroy Vera. On the eve of Vera’s birthday, Ferguson puts her plan in motion to take over the prison. 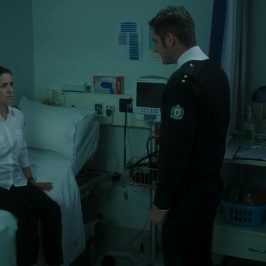 Instructing Jake to make Vera emotionally dependent on him, Vera’s initial rejection of his offer to move in with her puts Ferguson on the back foot. As rumblings against Kaz increase over her failure to bash Lucy for her attack on Sonia, Ferguson manipulates Lucy in order to up the pressure on the top dog. When Vera finally succumbs to Jake’s charms, Ferguson performs an ultimate act of terror to dethrone Kaz and become top dog. Allie enacts an all or nothing plan to kill Ferguson and avenge Bea’s death. Allie puts it all on the line and sacrifices more than she bargains for as she takes the final steps in her plan to hot shot FERGUSON. Meanwhile, WILL is intent on busting the drug ring and lays a trap. When a tip-off ruins his sting, he realises an officer must be involved. Franky’s quest to escape Wentworth takes its toll on her relationship with Bridget. Franky and Allie are drawn closer together on their quest to find a viable escape route, but their growing bond sends Bridget off the rails. Meanwhile Channing arrives to decide the fate of Sonia’s ‘Green Wall’ project, and Will makes a shocking discovery. When Will Jackson enlists Kaz and Allie to help expose Jake as the dirty officer, the effects ricochet through Wentworth testing long-term alliances, friendships, love and loyalties. Will forms an alliance with Kaz to expose Jake as the dirty officer. When they ask Allie to reveal a secret she is torn between her loyalty to Kaz and Red Right Hand, and her new friendship with Franky. Vera is forced to put the search for truth before her love for Jake. Franky and Allie formulate a detailed plan of escape but it will take ingenuity, courage and some help from Franky’s dad. Liz’s hopes that Don might come to her rescue are dashed and she blames Sonia. Franky discovers the truth about Mike Pennisi’s murder, only to have her hope of exoneration snatched away by Ferguson. Having discovered Iman’s social media connection to Mike Pennisi, Franky enlists Bridget’s help to discover the true nature of their relationship – Iman was Pennisi’s girlfriend. But when Franky confronts her, Iman reveals Pennisi’s obsession with Franky and admits she killed him in a jealous rage. Now blaming Franky for destroying both their lives, Iman attacks her with a shiv. Ferguson comes to Franky’s rescue but at the same time snatches away her only hope of exoneration, while pushing her own agenda to professionally crush Vera. Meanwhile, Channing’s investigation clears Jake of Will’s drug supplier accusations but, in the wake of a murder, sidelines Vera and assumes the role of acting Governor. Liz gets drunk with Sonia and hears a graphic confession to Don’s murder. But Vera is sceptical of Liz’s claims and cautions her against making further accusations against Sonia. Ferguson delivers Vera her coup de grâce, by revealing her alliance with Jake, with almost fatal consequences. When an increasingly guilt-ridden Jake defies Ferguson by encouraging Vera to leave Wentworth with him, Ferguson turns the tables by revealing the full extent of Jake’s duplicity to Vera. Humiliated and distraught, Vera confronts Jake and demands his immediate resignation. Confronting Ferguson, Jake is trapped when she reveals that her lawyers have ensured that the drug money trail leads directing to him. Realising there’s no way out of his pact, Jake attempts suicide but lacks the fortitude to go through with it. Ultimately, Jake plays the only card he can to protect himself: he uses his knowledge of Vera’s complicity with Bea to blackmail Vera. 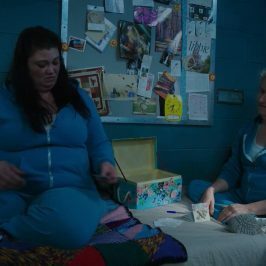 Meanwhile, Franky is released from the slot and plans her imminent escape with Allie, only for Kaz to urge her to join forces and bring Ferguson down. Swayed by Allie to help her family before escaping, Franky finds herself front and centre in a kangaroo court that gets out of control. When the mob attempts to lynch Ferguson, it is only Vera’s humanity – despite everything she’s suffered at Ferguson’s hands – that saves the Freak’s life. Franky is on the run. With the police closing in, she’s running out of time to prove her innocence, so she recruits a close ally to help her. Vera is determined to prove that Jake helped Ferguson break out. Meanwhile, new arrival, Rita Connors, seeks to reconcile with someone from her past. Sonia returns from near death, hell bent on revenge against her poisoner. On the outside, Franky uncovers evidence to prove her innocence, but the police net is tightening. Jake relinquishes his threat against Vera, and faces tragic consequences. With the help of Bridget, Franky races against time to deliver evidence that may finally clear her name. Meanwhile, Kaz faces her toughest challenge when she warns Hutch to stop fight club. Sonia continues her battle for freedom by manipulating both Liz and Vera into doing her bidding. A new inmate arrives in Wentworth, and unsettles both Allie and Kaz. Sonia will go to any length to reopen her Green Wall workshop. Meanwhile, Will is haunted by what he has done to Ferguson, and Jake scrambles to stop him from breaking down. As Vera contemplates abortion, she finds herself criticized by the press for reopening the workshop. When Jake selflessly saves Liz’s life, she is forced to reassess her opinion of him. Sonia’s P.R. campaign ramps up when she is officially crowned the Angel of Wentworth. And Rita becomes embroiled in Marie’s criminal machinations. As Sonia tries to spin her “Angel of Wentworth” PR into an innocence campaign, Kaz and Will form an alliance to derail her. In order to win Marie’s trust, Rita comes head-to-head with Drago, her second in command. 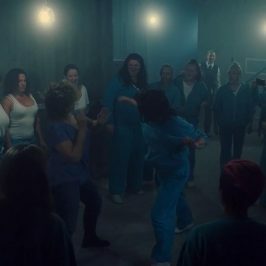 Meanwhile Liz deteriorates, becoming a target of the other prisoners. When Sonia is refused entry into Protection, she goes on the attack, setting up a plan to discredit Kaz’s position as Top Dog. With Marie onside, they set a scheme in motion, which may have drastic repercussions for Allie. Kaz returns with a whole new attitude as Top Dog – both protective of Liz, and tougher on the women. When Allie finds herself falling under Marie’s spell, Ruby aims to confront her, but pays a terrible price. Meanwhile, Vera becomes convinced that Jake is stalking her. When Vera claims to be stalked by an old nemesis, Will begins to unravel, causing Jake to doubt his resolve. After uncovering the secret of a close friend, Vera faces a dilemma – to report what she knows, or enter into a conspiracy. Meanwhile, Rita is caught in a trap set by Marie and Drago, while Ruby questions Allie’s loyalty. Marie discovers that Liz may have witnessed the attack on Cherry Li and tries to protect her from Drago. Meanwhile, Vera, Will and Jake face a blackmail threat – someone else knows the dark secret they are protecting. Marie smuggles CCTV images into Wentworth that feature her son’s attacker, setting Ruby in a panic. Realising that Allie’s loyalty to Marie is strong, Ruby faces a choice of breaking up with her. Meanwhile, the walls are closing in on Vera, Will and Jake as the blackmailer makes a power play that could destroy their conspiracy. With the heat of a police investigation directed at senior officers, Vera, Will and Jake face imminent discovery. Then a shocked Vera finally discovers the identity of her stalker, who has one last ultimatum. Meanwhile, Rita realises that Drago is intent on getting vengeance for Marie, leading to a final showdown between Rita and Drago.